Oh, it's me. I switched to deodorant that doesn't contain all the baddies (chiefly: aluminum, a heavy metal that's absorbed through the skin and has been linked to Alzheimer's, though this is a controversial point). 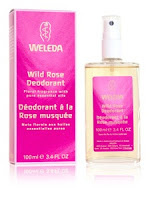 And usually, the Weleda deodorant spray I use works. Really. But I recently changed from the Rose scented version to the Citrus. Old rosey was more reliable. Which is sad because I wanted a fresh citrus scent for summer. Guess I'll just have to carry it around with me all day and reapply. Or just deal with my own natural scent. of the secrets of God. PS. My man wears the sage-scented version and it smells pretty good. And he doesn't stink at all. There was a time when if you said to someone that a clothing item was made of sustainable fabric you'd either get a blank stare or they'd imagine a burlap-like sack made of hemp. This, thankfully, is no longer the case. I also got a pair of black organic cotton leggings from Jaime Pressly's (yes the same from My Name Is Earl) clothing line J'aime. If you're lucky enough to be in NYC to visit the shop, it's at 83 Orchard St (btwn Grand and Broome). If not, you can get a taste online.